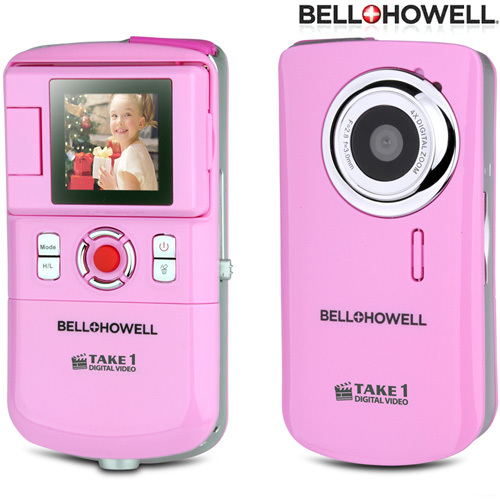 The Bell and Howell Take 1 digital camcorder and still camera with flip-out USB AND flip-out LCD screen is easy to use and easy to share! This camera features an ultra slim body, a 4x digital zoom, and can fit in your pocket for ultimate mobility. The Take 1 delivers 640 x 480 video resolution and captures images with 4x digital zoom and 3.1 megapixels! Your memories are preserved and ready for playback on your TV. Not only does the Take 1 deliver additional recording time when you use a SD/MMC memory card, you'll also appreciate the quick response time. Press the record button and your Take 1 starts recording video faster than you've ever seen before. In addition, when you review your footage, it will come up more quickly. Color: Pink.